The Remnant of Argon is an Argonian artifact created by the Root-Whisper tribe of Argonians, in a last ditch effort to save both themselves and their Hist from the invading Barsaebic Ayleids. The invading Ayleids had been harvesting the souls of their tribe at an alarming rate, and so the Root-Whisper Hist sacrificed itself to create the Remnant of Argon, an amber artifact that could contain the souls of the entire tribe until the Ayleid incursion had passed. 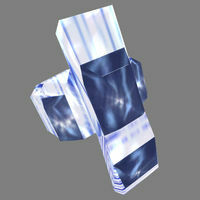 The Barsaebic Ayleids attempted to stop it's creation, but were held back long enough for the Remnant to be completed. Unfortunately, the Ayleids remained undefeated. Their leader, Myndhal, was driven mad in his quest for the Remnant, his attention having turned into an obsession with discovering whatever secrets the Hist had kept hidden from him. He and his mage, Houtern, created a network of portals all connected to a nexus realm in an attempt to either travel to wherever the now dormant Hist had hidden the Remnant of Argon or to break directly through into the realm of the Hists. This continued for many years, and an undead Myndhal would eventually be encountered within one of the now countless portals by the Soulless One. Meanwhile, though the Remnant of Argon was meant to only be a temporary measure, all knowledge of the Remnant was slowly lost to time. The Ayleid occupation lasted far longer than was anticipated thanks to Myndhal's obsession, and with the Root-Whisper Hist cut off from the rest of the Hists and the Root-Whisper tribe all but dead, there was no clear way for them to pass along the information of the Remnants location. Eventually, all knowledge the Remnant of Argon faded into obscurity, only remembered by the Hists and Argonians of Murkmire as something that invokes 'immense sadness'. Eventually, a group of historians known as Cyrodilic Collections came to Murkmire on behalf of their Argonian benefactor to collect and preserve ancient Argonian relics. Though their benefactor, Kassandra, seemed to be altruistic motivations at first glance, she secretly hoped that one of the artifacts discovered could finally allow her to become connected to the Hist, something that had been an impossibility for her ever since her birth into Dunmeri servitude. After Cyrodilic Collections discovered both the origin of the Remnant of Argon and the Rootmender's Staff, which could lead them directly to the Remnant, Kassandra betrayed them, stealing the Staff and leaving the rest for dead. 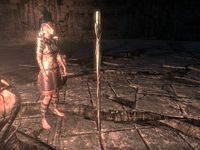 Kassandra used the Rootmenders staff and a Vakka Stone to open a portal from the Nexus Realm directly to the hiding place of the Remnant of Argon, with the Soulless One and Famia Mercius giving chase. Kassandra successfully uncovered it and, claiming to finally hear the Hist, was promptly devoured by a Miregaunt. Thanks to her control over the Remnant, however, Kassandra had managed to take control of the Miregaunt and had to be defeated by the Soulless One. Famia picked up the Remnant and carried it to the safety of the now long-abandoned Root-Whisper Village. There, the Soulless One, the Bright-Throat Xukas, and the Naga Jaxsik-Orrn traveled into the Remnant of Argon itself in order to finally lead the lost Argonian souls out and reawaken the Root-Whisper Hist. In order to do this, one of them needed to stay behind and guide them back at the cost of their life, though it is unclear whether it was the Naga or Bright-Throat that did this. Regardless, because of their sacrifice, the Root-Whisper tribe was reborn, and the Remnant of Argon was finally no more. 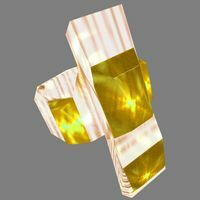 The Ring of Eidolon's Edge is a minor artifact. 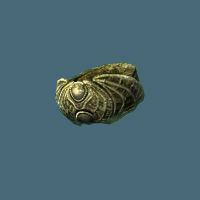 It is an ebony ring made in the Daedric style, likely enchanted with the soul of a lesser Daedra. 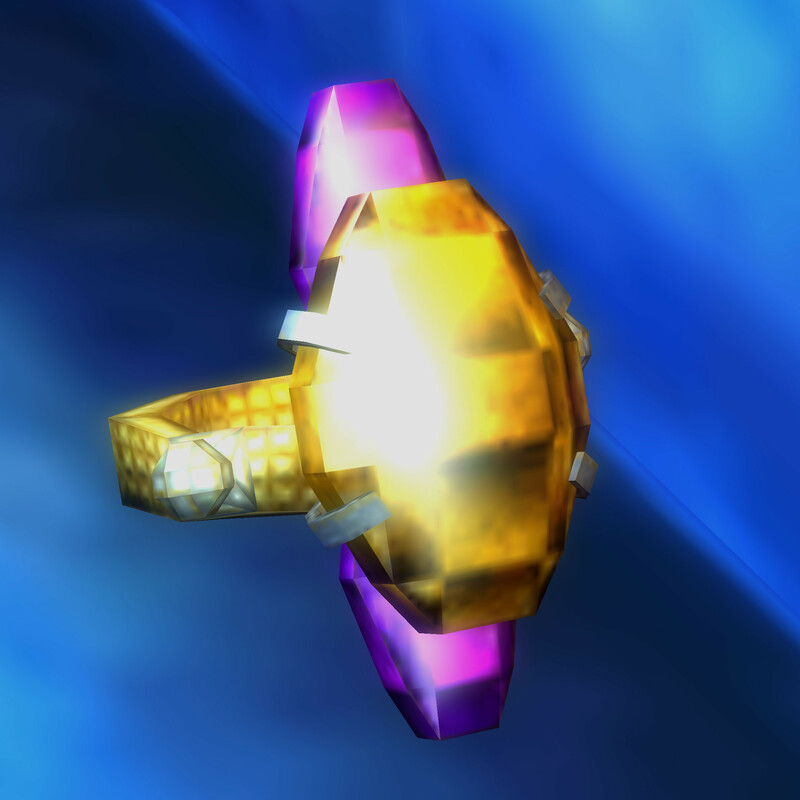 The ring magically increases the wearer's proficiency at using blades and shields. 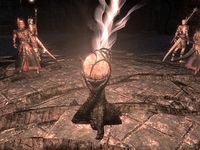 The identity of Eidolon and the origins of the ring are unknown, although a Daedric ruin named Eidolon's Hollow exists in the Deshaan region of Morrowind. 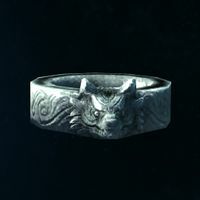 The ring came into the hands of a merchant in the Imperial City in the late Third Era. Rosentia Gallenus, a young Imperial woman with a passion for collecting unusual arcane craftwork, purchased the ring for a lover, although it returned to her possession when he left her for someone else. Rosentia later married a wealthy man in Leyawiin, and was left with his fortune and large manor when he died. She used her wealth to expand her collection, and in 3E 433 she came into contact with the Staff of the Everscamp. In return for helping her to dispose of the cursed Staff, she gave the Ring of Eidolon's Edge to the Champion of Cyrodiil. The Ring of Namira (or Namira's Ring) is a Daedric artifact bestowed by Namira upon those who do her bidding. The Ring has at times been known to reflect damage back onto an attacker, while other rumors say it gives bonuses to a person's health if the wearer cannibalizes a corpse. 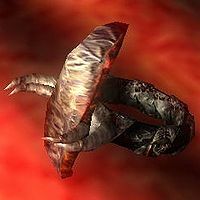 The Ring of Phynaster was made by the Hero-god of the Altmer, Phynaster. With the Ring and a new walking technique he discovered, Phynaster was able to live for hundreds of years. 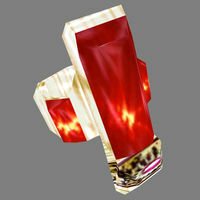 The Ring boosts the wearers resistance to poison, shock damage, and magicka. The Ring was also cursed by Phynaster so that it eventually disappears from its holder's possession. The Ring of Surroundings is a little-known artifact that allows the wearer to blend in with their surroundings. It was last seen in the hands of the Nerevarine in 3E 427. The Ring of the Wind is a little-known enchanted ring which has appeared in a few rumors. It grants the wearer added speed. 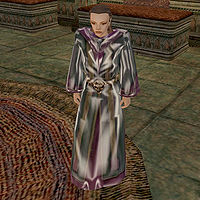 The Robe of the Lich belonged to Gedna Relvel, an infamous priestess in Mournhold who was condemned for studying and practicing forbidden magics. However, she had turned herself into a lich and survived beneath the city for untold years. In 3E 427, the Nerevarine opened her tomb and eventually dispatched her, claiming the robe. It was then sold to the Mournhold Museum of Artifacts. The Rootmender's Staff, formerly known as the Sap-Speaker's Staff, was an artifact entrusted to the Soulless One during their expedition in Murkmire by Sap-Speaker Kuzai of the former Root-whisper Tribe. It was materialized out of a lifelike vision of the past into reality. It was quickly snatched by the traitorous Kassandra with the intent of using it to locate another artifact known as the Remnant of Argon which contained the souls of the former Root-Whisper Clan. With the Rootmender's Staff, Kassandra attempted to delay the Soulless one by summoning powerful Hist beams from the staff but it was not enough to fend them off and fled deeper into the xanmeer. She found the Remnant of Argon further in the xaanmeer but was consumed by a Miregaunt and had to be put down. After Celebrations of their victory over the Blackguards ,both artifacts retrieved, reformation of the Root-Whisper Tribe, the Argonians of Murkmire granted the soulless one the Rootmender's staff along with the title of Rootmender. 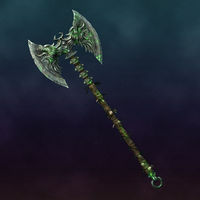 Ruin's Edge is a Mazken dark bow associated with Syl, Duchess of Dementia at the beginning of the Greymarch of 3E 433. The fabled bow applies a random enchantment to each arrow; it has been known to cause paralysis, silence, demoralisation, frenzy, burden, and frost damage, and to drain magicka. 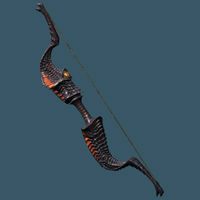 The bow itself is ribbed Daedric ebony inlaid with a moving eyeball. In 3E 433, Sheogorath sent the Champion of Cyrodiil to Syl's court to become a courtier of the House of Dementia. After revealing a conspiracy in Crucible to assassinate the Duchess, Syl rewarded the Champion with Ruin's Edge. By 4E 201 the bow had left the Shivering Isles and had come into the possession of a bandit chief. It was recovered from the bandit by the Last Dragonborn in Stony Creek Cave, a small natural cave in the Eastmarch region of Skyrim. This page was last modified on 4 April 2019, at 21:24.